Long before there was Marvel Comics, there was Timely Comics. It was under the Timely Comics name that Captain America would be published by legendary comic creators of Joe Simon and Jack "The King" Kirby. 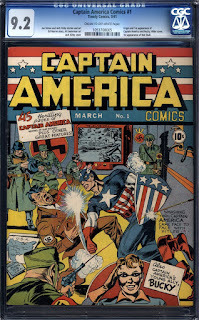 Captain America Comics #1 was published in the Golden Age during WWII. During those years, war comics were immensely popular. There were only a handful of superhero titles available at the time like Superman and Batman and even they were at times depicted facing the Nazis and Japanese armies. War was big business for the comic book industry. As you can see, this comic is packed full of first appearances for some iconic characters, the first being Capain America. It also has the origin of how Steve Rogers became the iconic character from the Super Soldier Serum developed by the government. 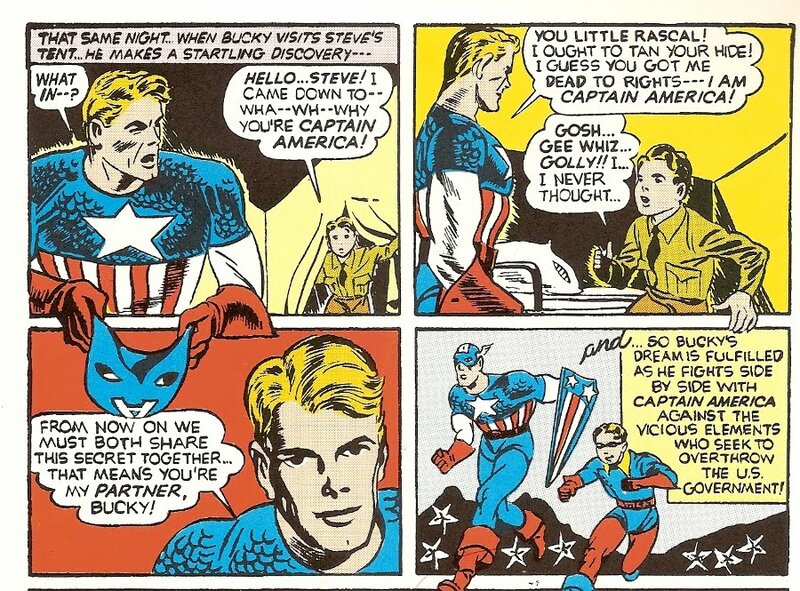 Captain America Comics #1 also has Bucky Barnes first appearance. James Buchanan "Bucky" Barnes is Captain America's long time faithful sidekick. Bucky, in the modern age of comics, does become the Winter Soldier, but I don't want to get too far ahead of myself here. Now let's get to some bad guys here. We also get the first appearance of Red Skull. The Red Skull that appears in Captain America Comics #1 is not the same as the more popular version of Red Skull. In this comic, he is George Maxon. Maxon often wears a red mask to rob banks to raise money to overthrow the U.S. government. Sounds like a pretty weak villain to me. Johann Schmidt is the more menacing version of Red Skull that most people know. His first appearance is in Captain America Comics #7. Lastly on the list of 1st appearances is Agent X-13. Agent X-13 is also known as Elizabeth "Betsy" Ross. 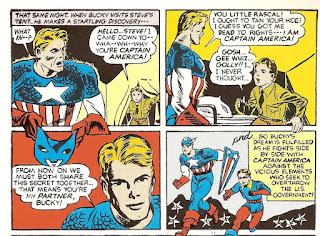 Betsy Ross is an FBI agent that often found herself in trouble and needing to be rescued by Captain America and Bucky. She was the damsel in distress character. 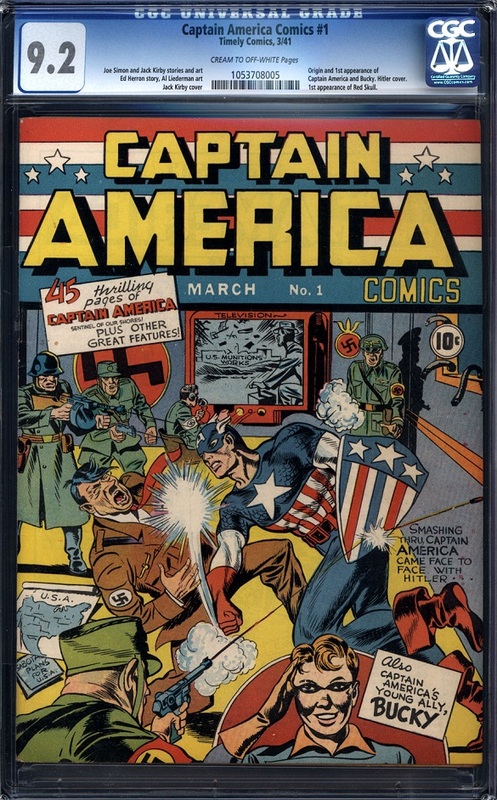 For a comic that was published in 1941, there are 147 copies of Captain America Comics #1 graded by CGC. I was surprised there were that many. The highest graded copy is Universal 9.8 NM/M. That, to me, is amazing. Even with that many copies graded, finding any sales information is hard to do. The only confirmed sale I could find was at ComicConnect.com in 2011. The comic sold for a whopping $343,000. This comic is definitely no lightweight. But with one of comics most iconic characters first appearances, it should be. This isn't going to be an easy book to find in any grade but most graded copies listed in the CGC census are in the 6.0 F to 8.0 VF range but expect to throw down some dollars for them, even in lower grades.